My mom suggested earlier this week that since I finished my cousin's quilt that I should also make one for my aunt. Maybe because it would be a bit awkward at Christmas when my cousin opened her present and nothing similar was available for her mom. So after some thought about my aunt's decorating scheme and colors she seemed to favor, I decided to focus on blues and browns. The quilt also needed to be a quick design, but nothing too simple because then it would just be boring to piece and a chore to make. The disappearing nine-patch block seemed a good compromise and the top came together quickly except that the finished size was too small: 36" x 36". Perfect for a baby quilt, not so perfect for a grown woman. So I did what I always seem to end up doing whenever I make a quilt improvisationally, which is to say, get all the left over fabric and figure out something while munching potato chips for brain food. In this case that ended up being deciding to add a border made up of 2.5" squares strip-pieced together, which gets the quilt to an eventual 48" square. 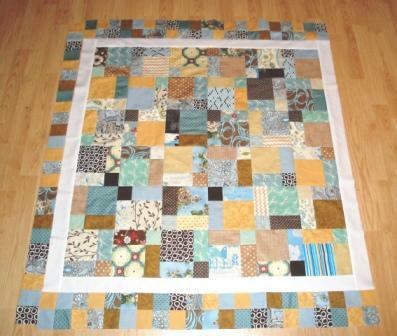 Since I want to make the quilt at least 52" square, I'll have to figure out how to add an additional 2" on each side. And soon.